The Message in the Sky – I Believe in Angels – Do You? My mom and I were very close. After a stroke in 1992, she had right side paralysis and my father became her primary caregiver. She loved life and never allowed the stroke to hold her back. In 2010, my father became wheelchair bound, making it difficult to provide the best care. My husband and I left everything behind and moved in with them to provide care as it allowed them to remain independent and together. My dad was diagnosed with Alzheimer’s last year, and she became very extra-mental in caring for him, helping him to remember things and comforting him through his journey. My mom never met a stranger and always carried the biggest / brightest smile. She always glowed. She believed in God and angels. Approximately three months ago she fell and was in and out of the hospital. She developed pneumonia and respiratory failure and was placed on a ventilator and feeding tube. It was so hard for me to watch her go through that. I stayed with her day and night. She kept trying to communicate something to me, and I couldn’t understand because of the tubes. I would kiss her and say, I love you too. My heart broke when she passed away on 9-8-2016 at 10:59 pm. I was by her side. The next morning I woke up so sad and in disbelief, I walked outside, and an airplane was flying directly over the house writing a message in the sky. The message said: “Trust Jesus. Ask. He 4 gives. 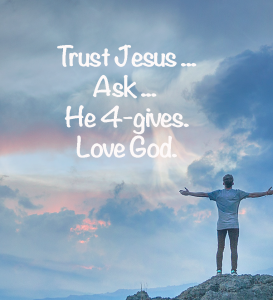 Love God.” As I recorded this message in the sky, wind chimes were chiming the prettiest sound I’ve ever heard; dragonflies were flying all over. At that very moment, I knew my mom was with Jesus, and she was safe; she is my angel. I felt like my mom’s spirit nudged that pilot that day to be in that place at that moment to give me a message. Although in the end, she was unable to communicate to me, she found a way. Praise God always! I love you Mom – Joyce Ann Crum.